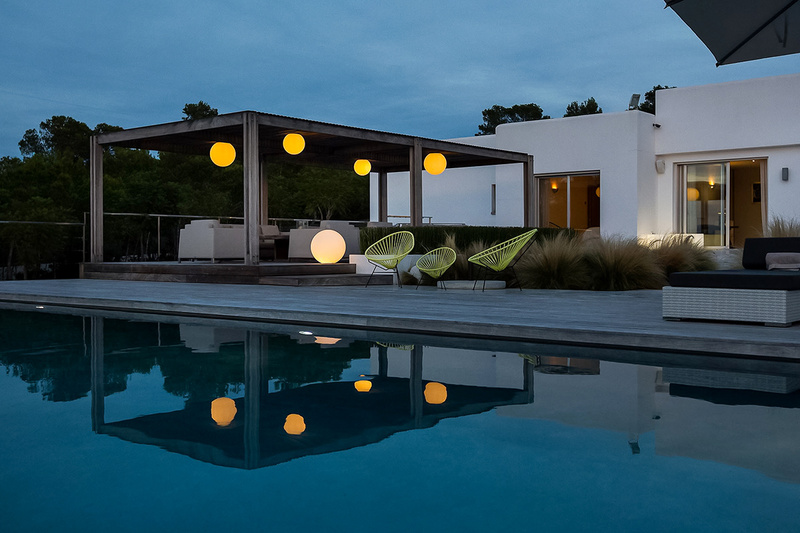 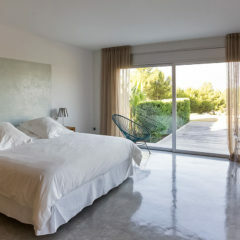 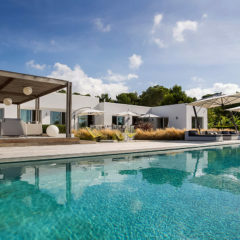 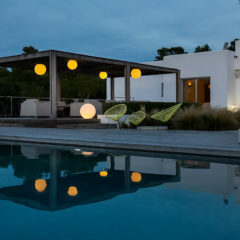 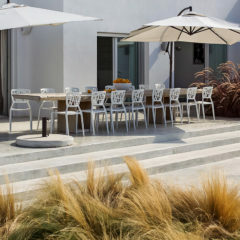 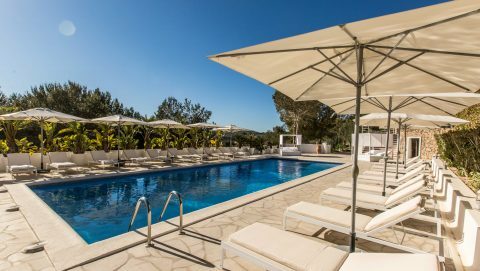 Villa Body & Mind is located in the beautiful bay of Cala Comta and has 6 bedrooms with 4 bathrooms. 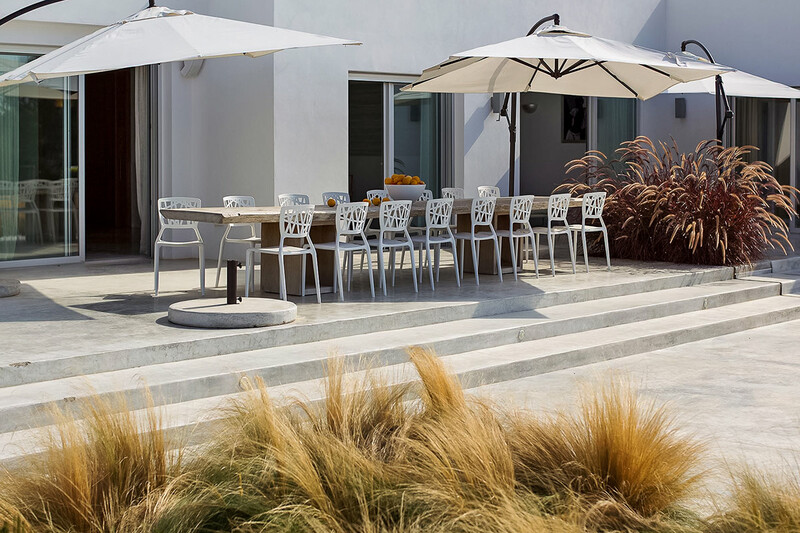 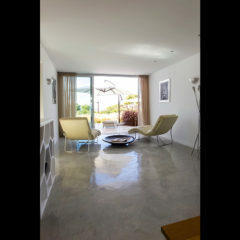 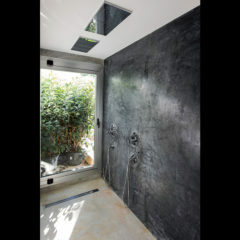 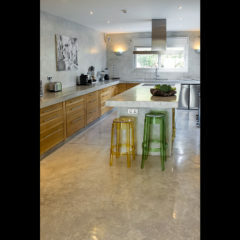 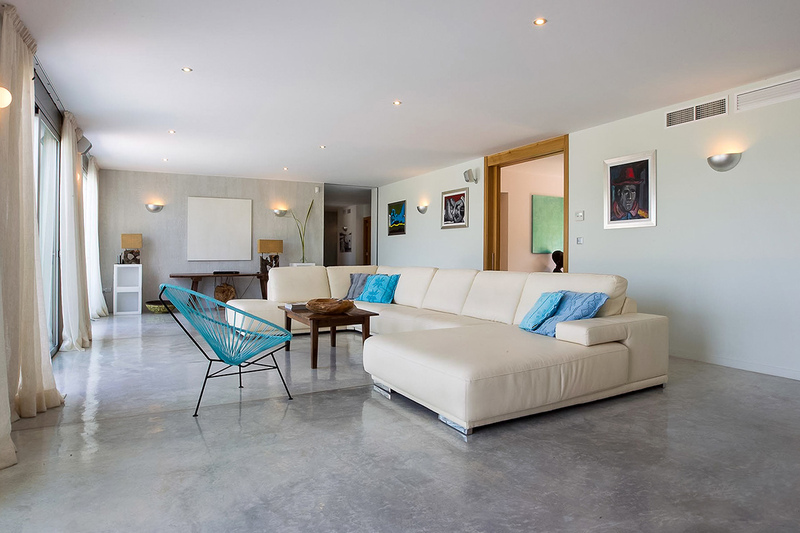 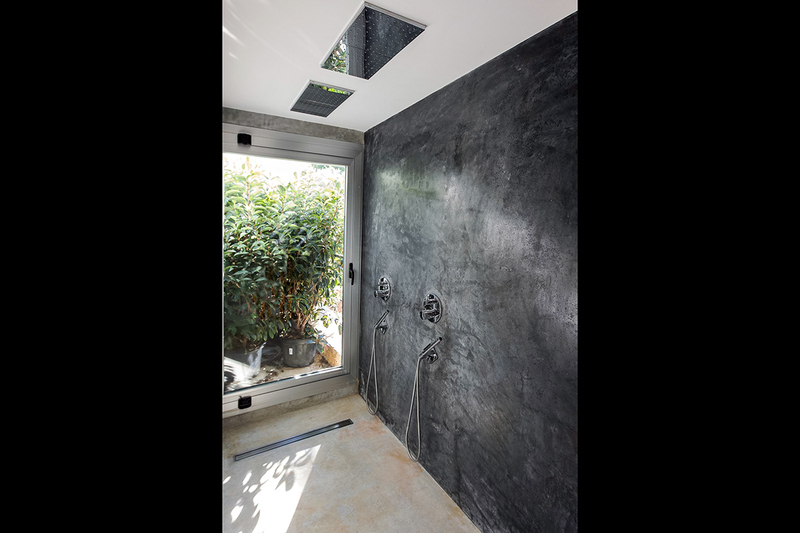 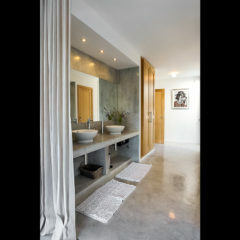 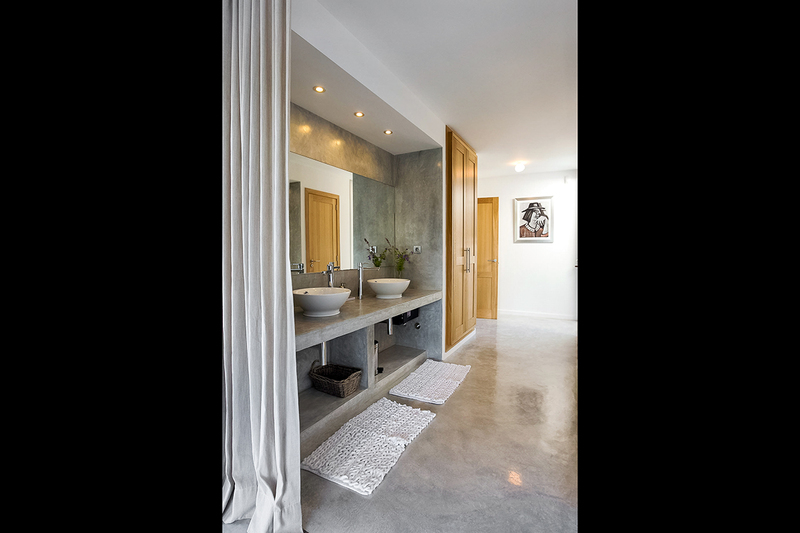 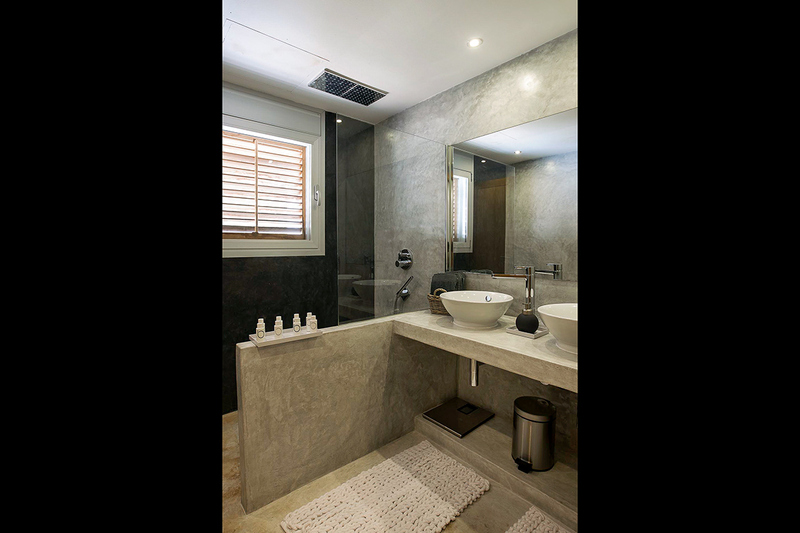 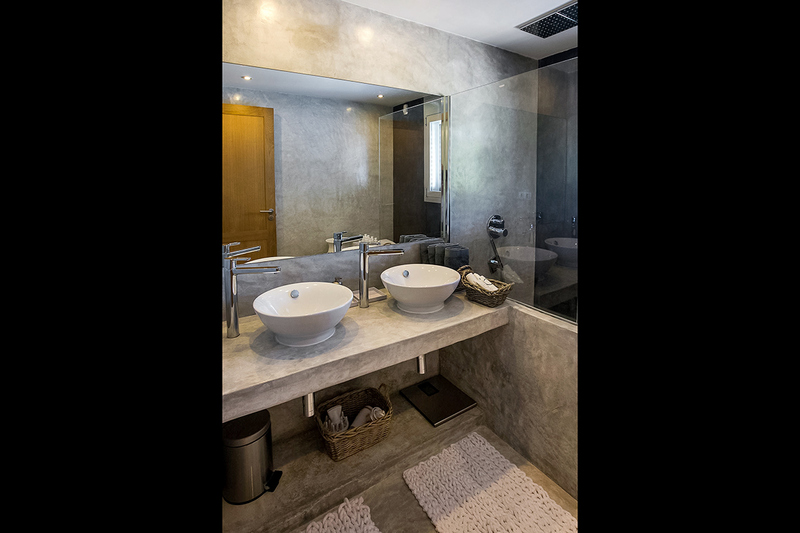 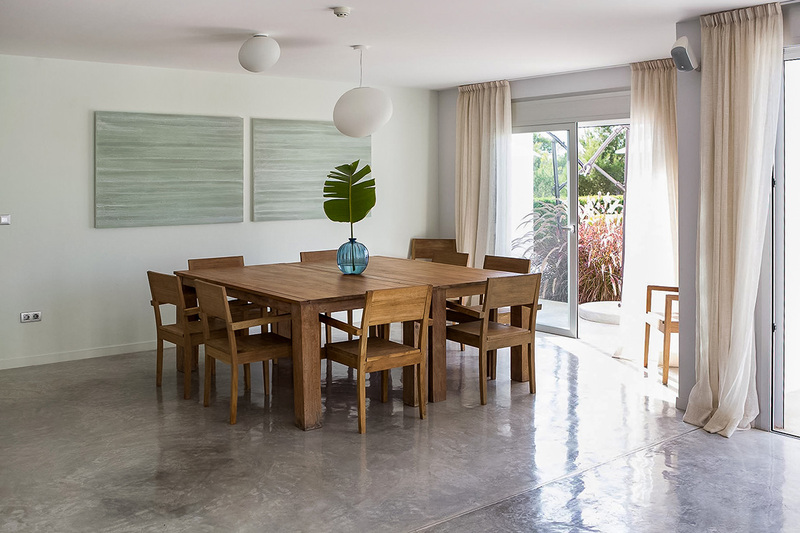 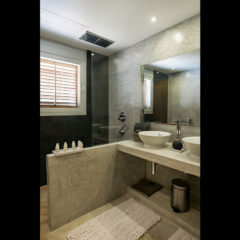 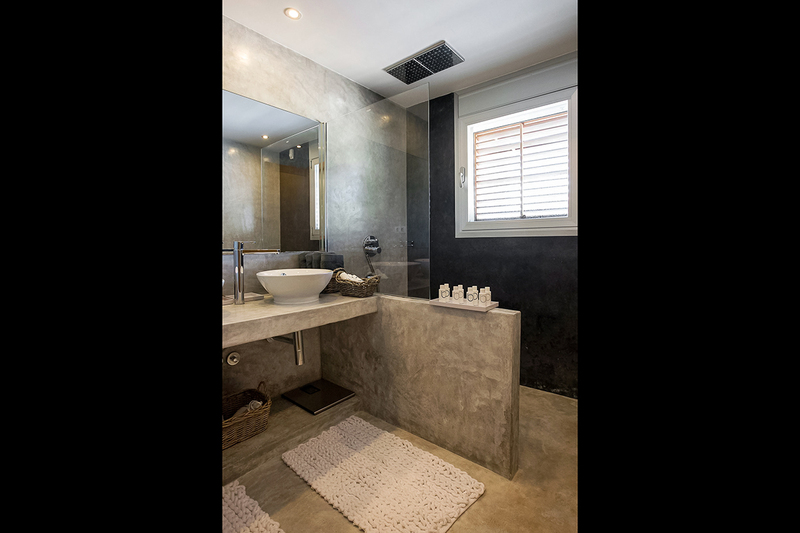 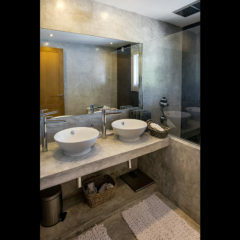 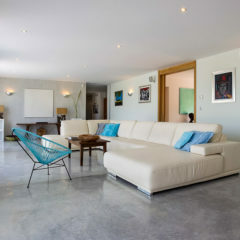 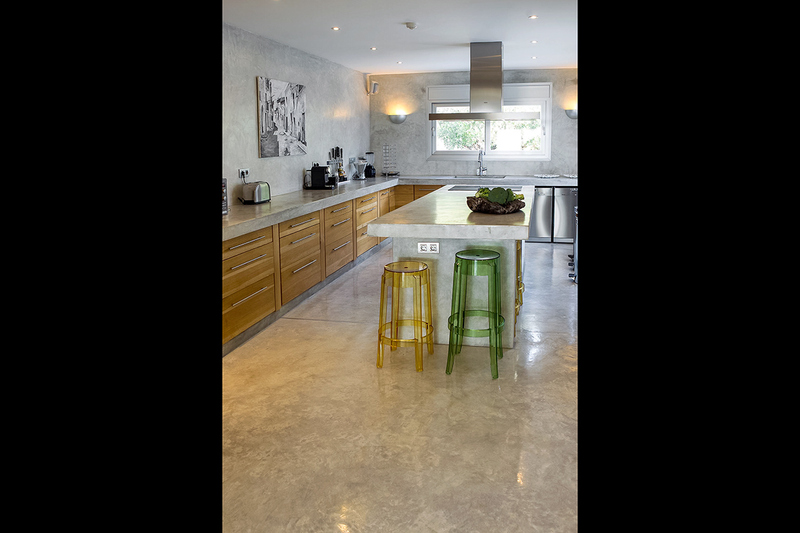 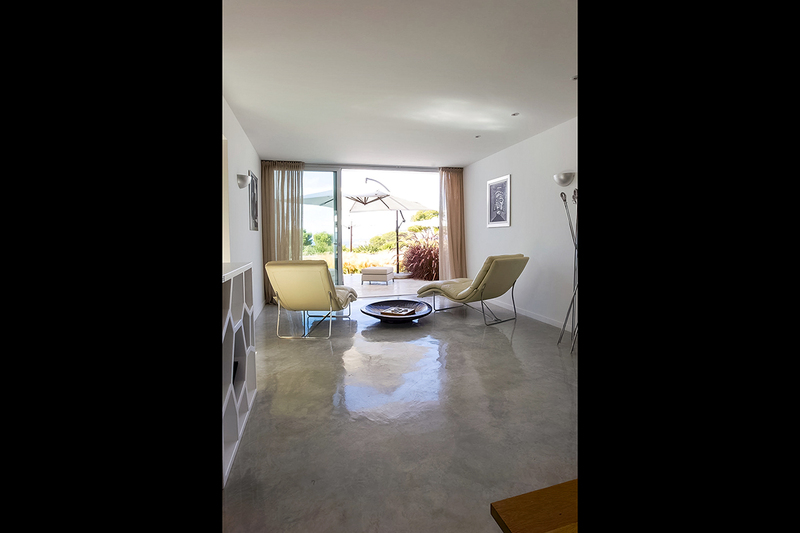 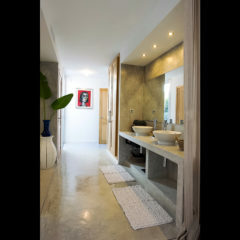 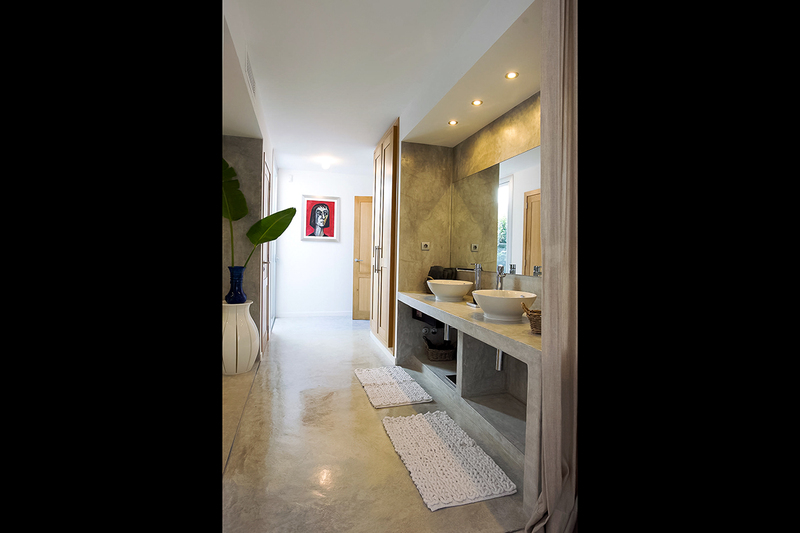 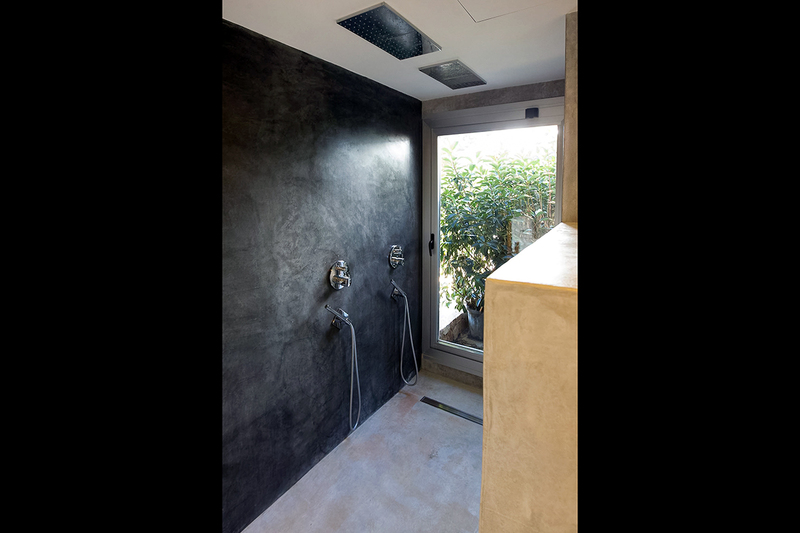 The architecturally sophisticated and modern style with natural concrete floors can accommodate up to 12 people. 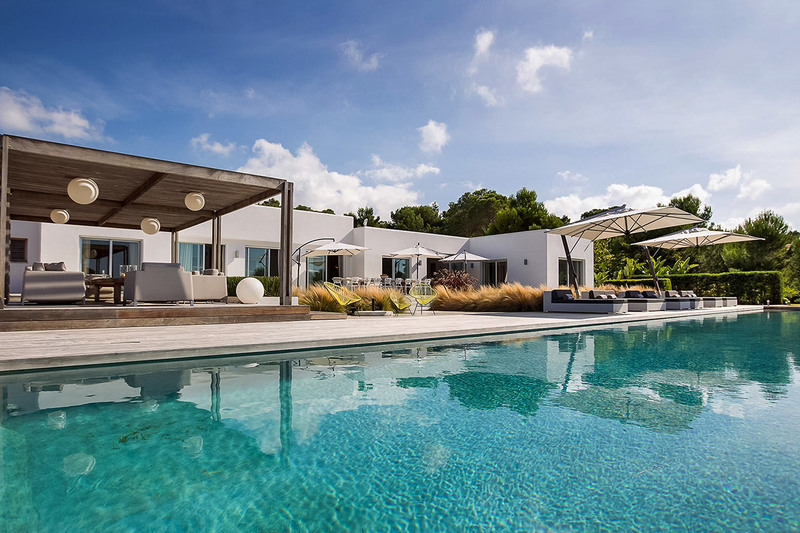 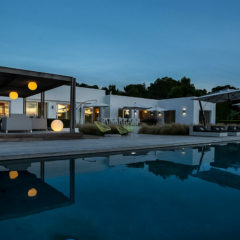 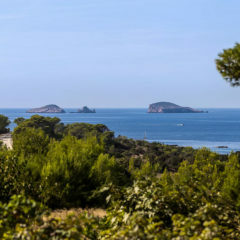 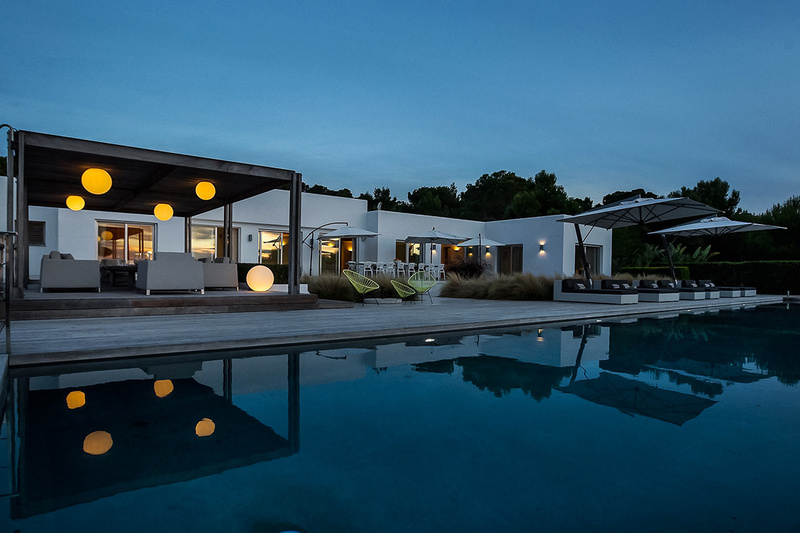 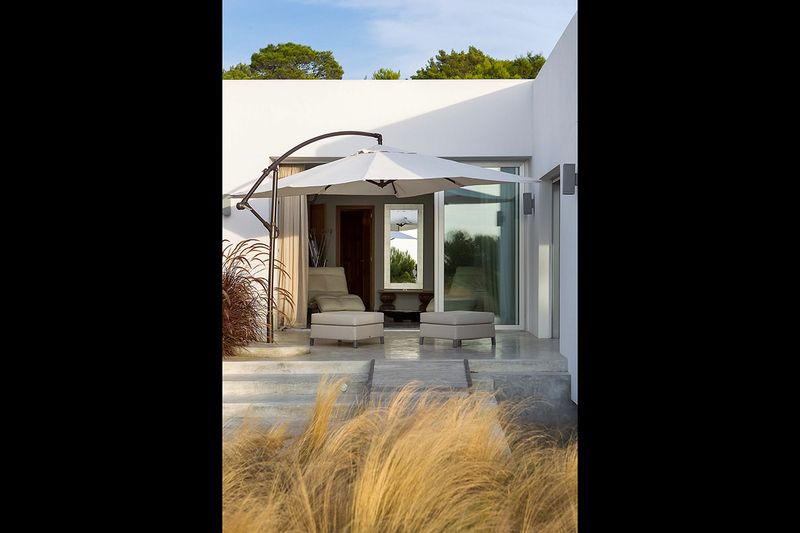 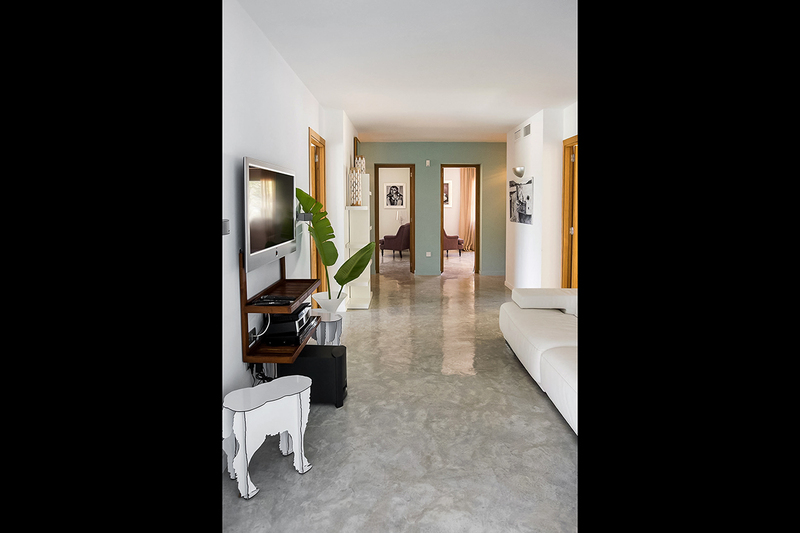 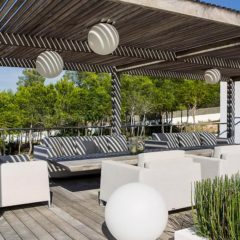 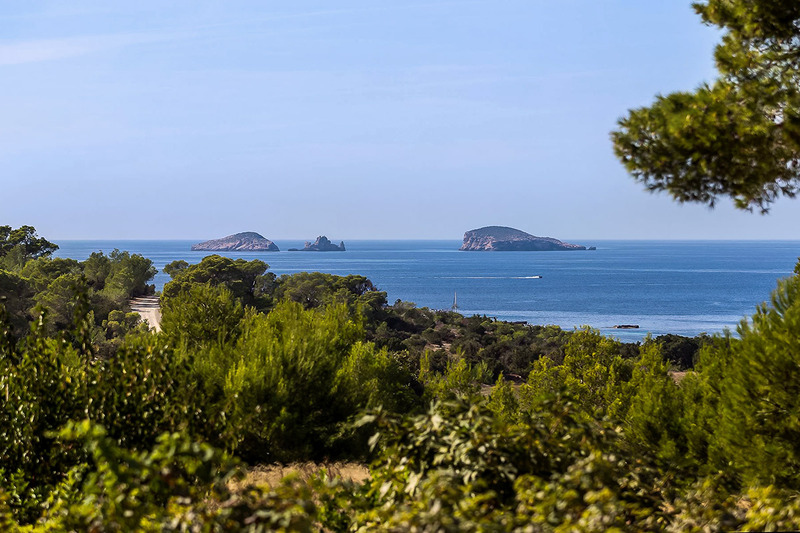 Luxury and modern elegance on 400 sqm of living space, 800 meters from the beach, surrounded by a fenced 16000 sqm plot with luminous fruit trees and pine trees, leaves nothing to be desired. 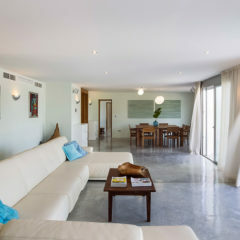 The large living area, equipped with a satellite TV, Bose Soundsystem and Blue Ray Player also offers a great view of the terrace and the pool. 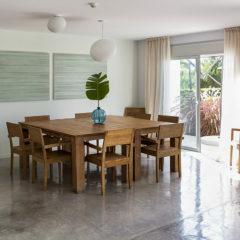 A dining room with sea view and a fully equipped, modern kitchen with 2 refrigerators, 2 dishwashers and storage room make cooking a unique experience. 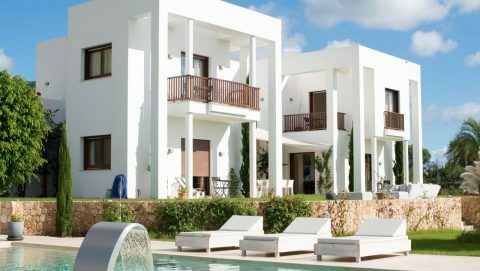 The villa has 6 double bedrooms. 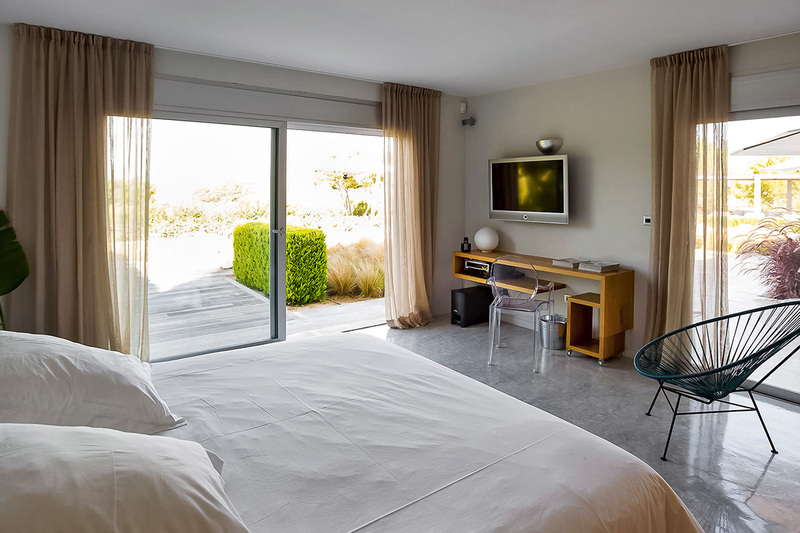 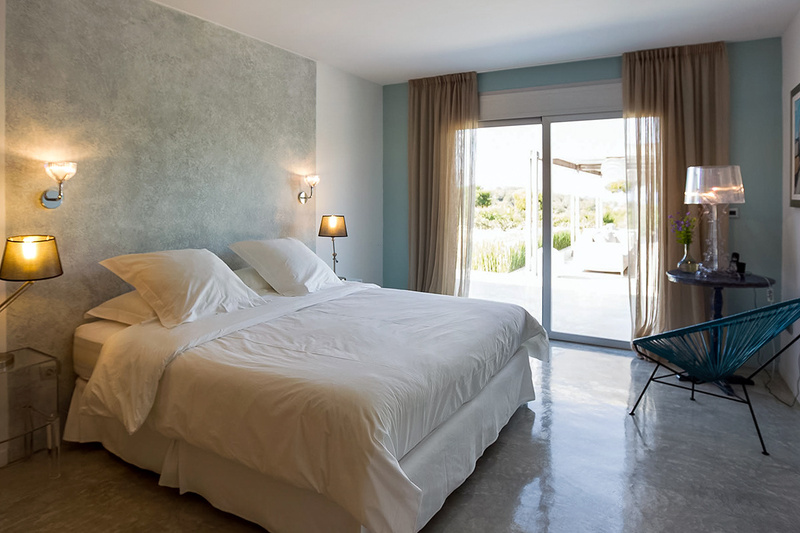 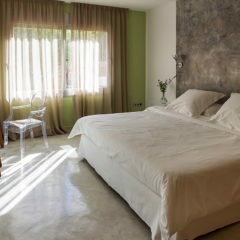 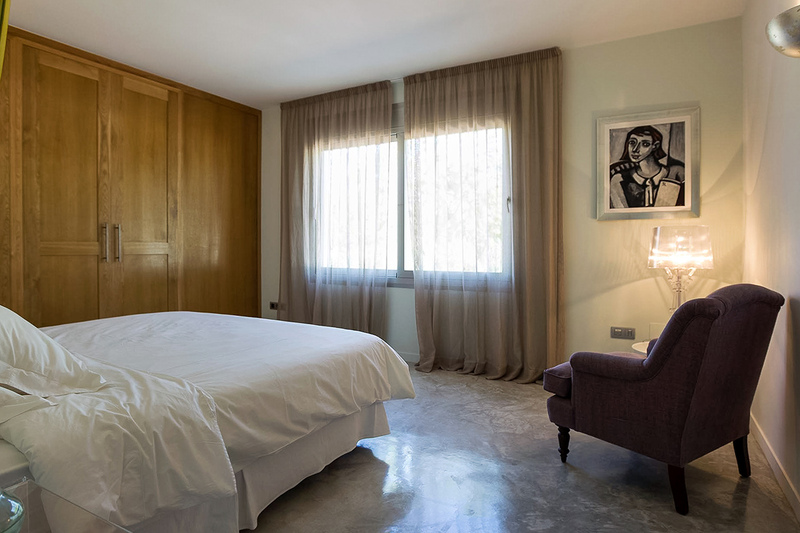 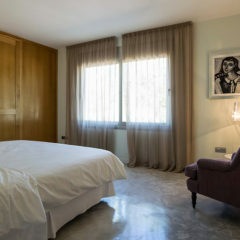 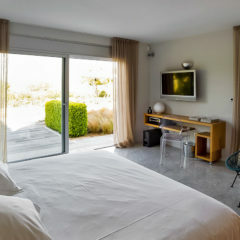 The main bedroom with sea view has a king size bed, a bathroom en suite with double shower, TV, blue ray player, a private garden and direct access to the terrace. 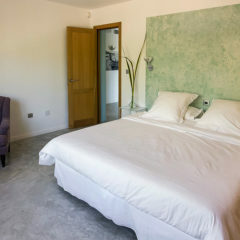 The second bedroom has a king size bed, bathroom en suite and TV. 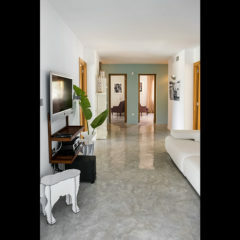 The other 4 double bedrooms with sea view share 2 full bathrooms. 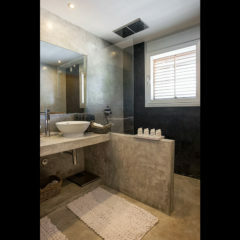 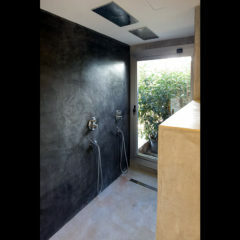 In all bedrooms is air conditioning, and a safe. 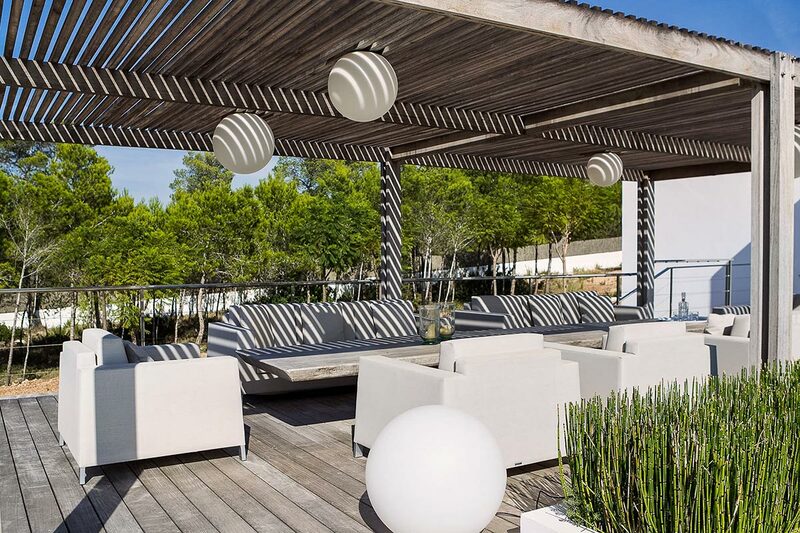 Over the terrace you can reach the infinity pool of 23 × 5 meters, surrounded by a wooden deck and a beautiful garden. 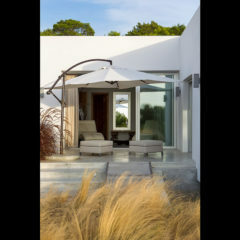 A covered pergola provides shade in the external dining area with barbecue. 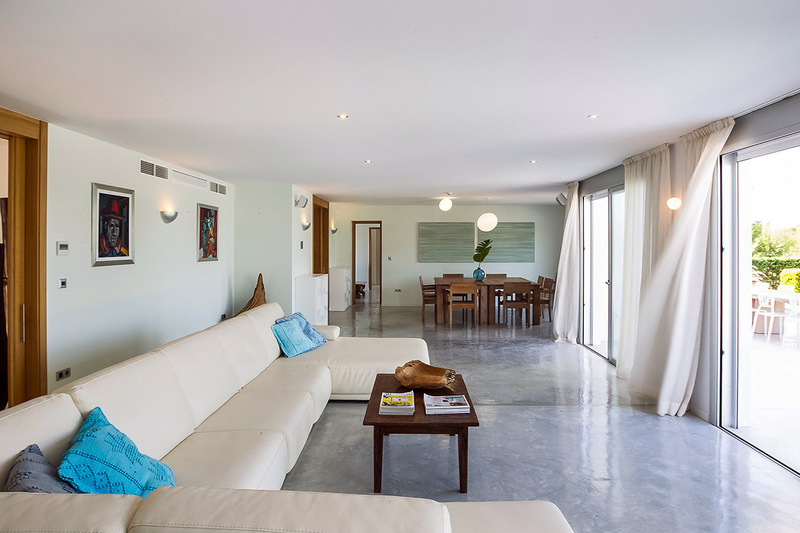 On the lower level of the villa is a garage for 4 cars. 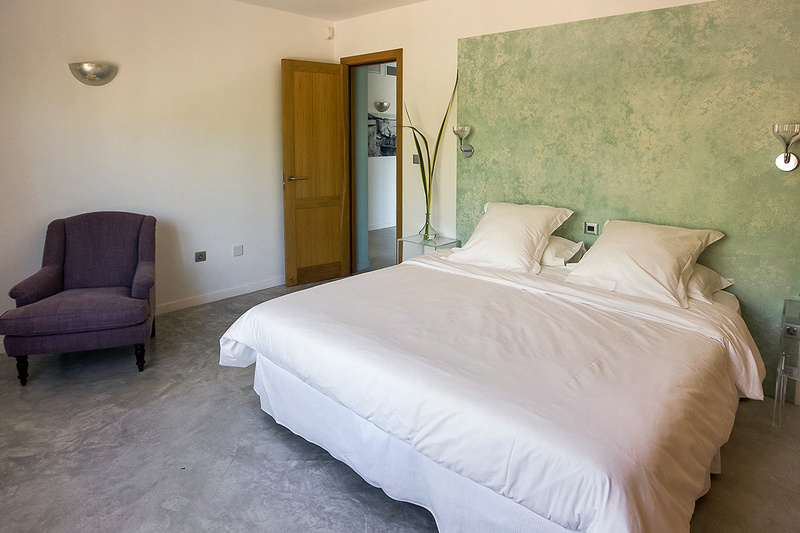 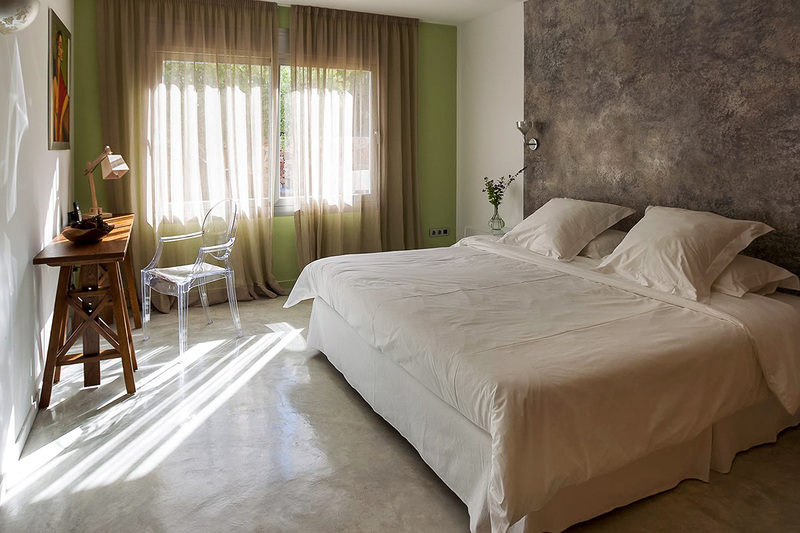 The villa offers WiFi, alarm system, fire alarm and a high-quality music system with indoor and outdoor speakers. 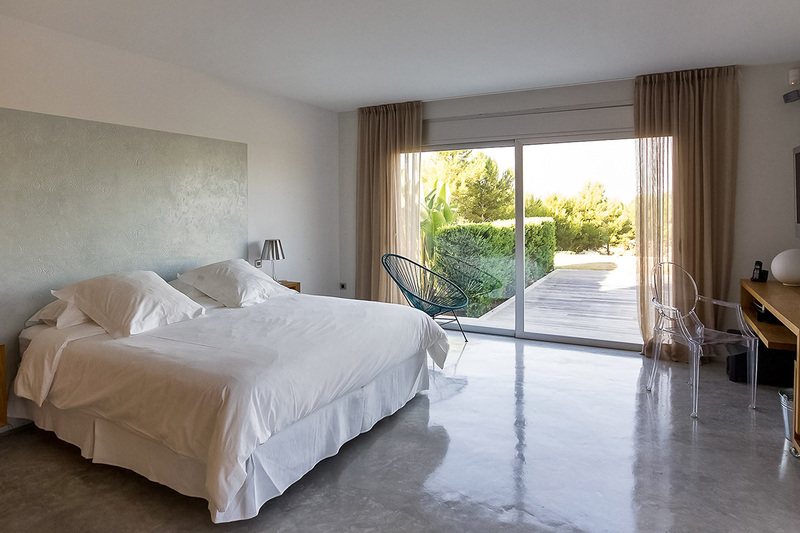 Book this unforgettable dream on “La Isla Blanca” now.